Historically, orthodontic treatment of alignment issues involved metal or ceramic brackets for the vast majority of patients—especially adolescents—to realize the necessary corrections. This orthodontic patient base consisted mostly of children between the ages of 6 and 18. Since clear aligners were introduced, however, they have increasingly gained in popularity because they can address the full gamut of orthodontic needs. Unfortunately, that wasn’t always the case; the first clear aligners treated only mild malocclusions, such as crowding and spaces between teeth.1 As a result, if a patient needed more complex corrections, they were required to get ceramic or metal braces. The only other option for patients who wanted a less noticeable, more aesthetic alternative for straightening their teeth, was “clear” ceramic braces. Few teens, but many adults, chose this option. Today, adolescents and adults are enjoying the benefits of clear aligners for straightening their teeth and addressing a multitude of orthodontic issues. The technology has improved greatly in the past decade, and now, virtually all orthodontic issues that previously could be achieved only with ceramic or metal appliances can be corrected with clear aligners. 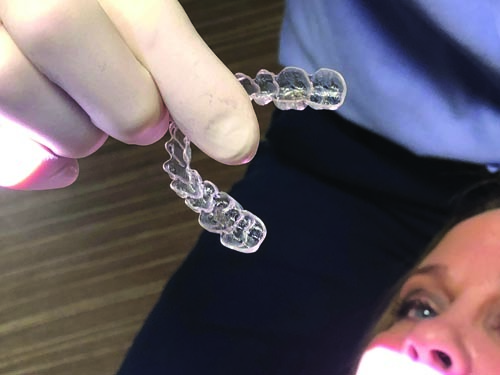 Success with clear aligners is predicated on proper case selection (particularly for adolescents) and education, and adolescents are actually fairly compliant. In my practice, more than 400 aligner cases have been initiated, and only two teenage patients were switched to traditional braces. In fact, selection of braces versus clear aligners is approximately 70 percent to 30 percent. Clear aligners’ benefits over traditional braces include greater patient comfort, easier oral hygiene and enhanced aesthetics during treatment.5 Research has shown that patients undergoing clear aligner orthodontics experienced less pain compared with patients wearing fixed orthodontic appliances. Fig. 1: The teeth were isolated using a soft, flexible and latex-free lip and cheek retractor. Fig. 2: Bonding agent was applied to the teeth where attachments would be placed according to the manufacturer’s instructions. Fig. 3: The clear aligner, with the attachments in place, was seated and light-cured using an LED curing light. Fig. 4: The attachment template was carefully removed, leaving only the attachments bonded to the tooth structure. Fig. 5: Excess flash on the attachments was removed using finishing stones. Fig. 6: The patient examines the appearance of the 14 attachments. Fig. 7: The patient was fitted with the clear aligners and provided with detailed instructions for insertion, removal, daily wear time and care. Fig. 8: View of the patient during her first six-week recall appointment. 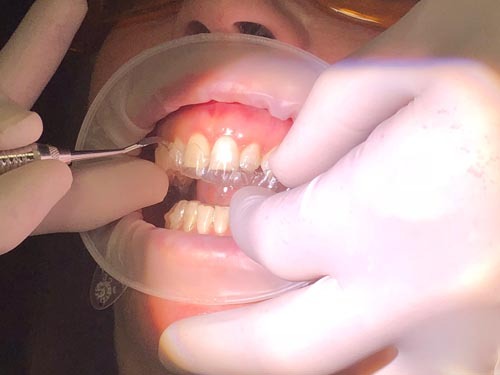 A 46-year-old patient presented for a secondary consultation after receiving a quote for clear aligners from a general dentist, and she wanted another opinion. Ten years earlier, she was informed during a consultation that she was not a candidate for clear aligners, so she chose not to undergo orthodontics altogether. 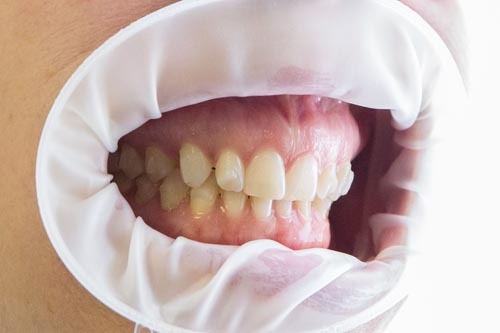 A professional in the dental industry, the patient said her primary concerns were spacing and overlapped teeth, and she specifically stated that she wanted a straighter smile without undergoing fixed prosthodontics. 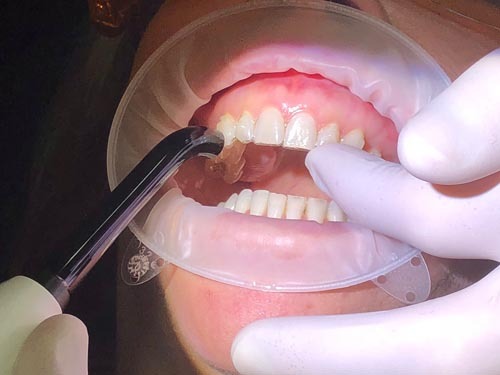 During the consultation, it was determined that the patient had a mild overjet and mild overbite. There were spaces between the maxillary teeth and mild crowding in the mandibular arch. Both maxillary and mandibular teeth shifted to the right. The patient had a Bolton tooth size discrepancy, where the maxillary incisors were narrow and the lower incisors were wide. The patient also had worn incisal edges on teeth #24 and #25. Oral hygiene was excellent, the skeletal profile was convex and there was no evidence of temporomandibular joint dysfunction. 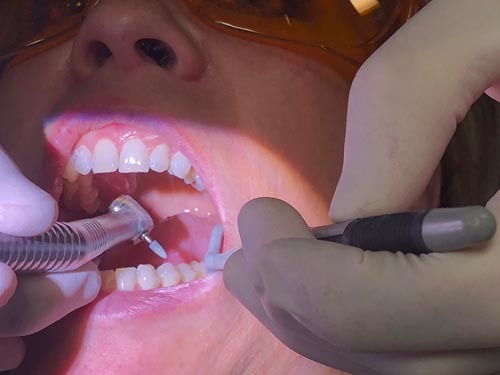 CAD/CAM dental technologies were used to perform a diagnostic examination, outline a digital treatment plan for progressive tooth movements and visualize the anticipated treatment outcome. 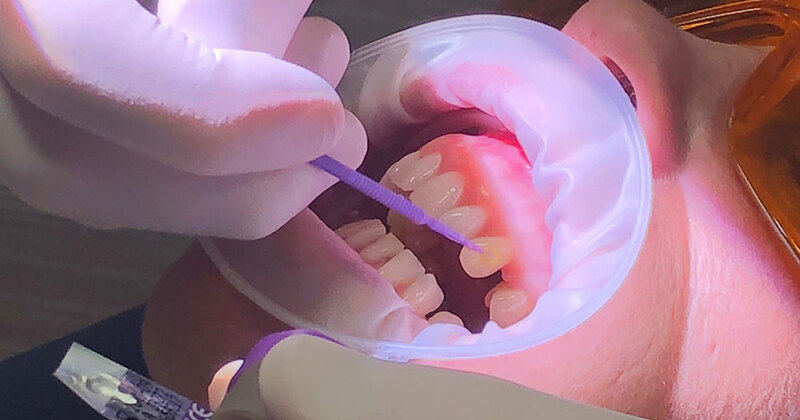 With clear aligners, the basis for treatment is a virtual model; therefore, the patient’s maxillary and mandibular teeth and arches were scanned using an iTero Element intraoral scanner to capture digital impressions of the patient’s pretreatment condition. Digital impressions and the software used to plan the patient’s tooth movement, along with the doctor’s experience, determine if composite is more accurate for treatment planning than using traditional impression materials and stone models.8 Once the scans were taken, they were reviewed on screen, after which the aligner software manipulated the scans to demonstrate how the patient’s teeth would move during the course of treatment. At this time the patient was inquisitive and asked what the difference would be between clear aligner treatment from an orthodontist and at-home aligner solutions via an online aligner company that lets patients take traditional impressions at home and send them to the company to receive less-expensive aligners. She was informed that the thorough examination and diagnostic plan determined that her specific alignment issues required the use of attachments and interproximal reduction to create space for proper tooth alignment, optimal function, stability and aesthetics. It was also explained that the basis of the orthodontic practice was discussing and providing information about all alternatives for patients to make the best treatment decisions and achieve the best possible results. Clear aligners with interproximal reduction to improve alignment, normalize Bolton discrepancy and eliminate the need for further dental work (i.e., veneers). Preprosthetic alignment with clear aligner therapy, in combination with aesthetic maxillary anterior bonding. Prosthodontic treatment to enhance smile aesthetics with no orthodontic treatment. The patient selected Option 1. Based on the consultation, the computerized treatment plan was finalized, and the case sent to the clear aligner company.10 By using the 3D software, proper tooth alignment was achieved, attachments were chosen to facilitate the tooth movements with the clear aligners, interproximal reduction was prescribed in specific areas on the lower arch to assist in maxillary space closure, and the proper staging of tooth movement was assigned. For the first batch of aligners, treatment was staged with weekly aligner changes over 54 aligner stages. All attachments—14 in total—were placed during Stage 1 on teeth #4–7, #10–13, #20-22 and #27–29. Interproximal reduction was prescribed at Stage 7, at the contacts between teeth #22–27. An appointment was scheduled to place the attachments and begin the 54?weeks of orthodontic treatments. 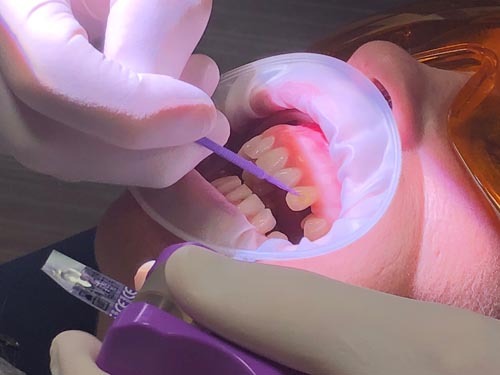 During this appointment, the teeth were isolated using a flexible latex-free OptraGate lip and cheek retractor from Ivoclar Vivadent (Fig. 1, p.?30), which reduces salivary contamination of the attachment teeth. 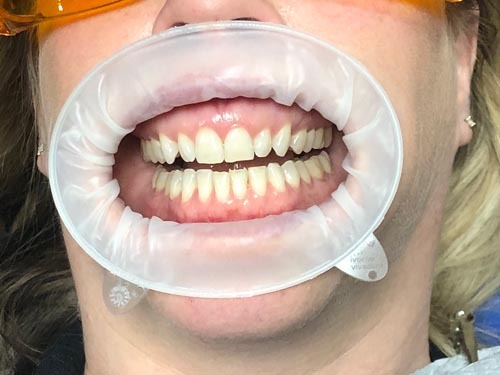 The prefabricated attachment template was then tried into the patient’s mouth to ensure a proper fit, after which it was removed, and the first aligner tried in to confirm an ideal fit. The enamel was etched and rinsed in the areas and on those teeth in the predetermined shape and location for the attachments. Transbond Plus Self Etching Primer bonding agent from 3M Unitek was applied to the teeth where attachments would be placed, then light-cured (Fig. 2, p. 30). Because patients who choose clear aligners are usually very self-conscious about their appearance and aesthetically aware, it is imperative that attachments appear as seamless and invisible as possible. Therefore, the composite material selected for creating the attachments was a translucent universal nanohybrid composite with natural shade blending, Tetric EvoCeram from Ivoclar Vivadent in shade T.13 Additionally, the selected composite demonstrates exceptional wear resistance and tends to last for the entire treatment process. (Fig. 5). The patient examined the appearance of the 14 attachments and was pleased with how well they blended into her natural dentition (Fig. 6). Once the patient was comfortable with her new clear aligners (Fig. 7), the next appointment was scheduled for six weeks later (Fig. 8, p. 34). At that time, interproximal reduction would be performed as planned, and the patient would receive the next six sets of clear aligners. As dental professionals and orthodontic specialists, it is our responsibility to provide patients with information about all possible treatment options to help them achieve their aesthetic goals and maintain optimum oral health. Given the many options available for perfecting their smiles, some patients may choose fixed prosthodontics, others may choose orthodontics, and some may choose a combination of both. What is right for one patient may not be for another, but our discussions with patients enable them to make the best decision based on their current situations and the options we provide to maximize their results and expectations. Therefore, our goal during these conversations is to be as upfront and honest with our patients as possible, since that is the only way our patients can benefit from our professional experience. Our experience can provide patients with life-changing results and increased confidence. 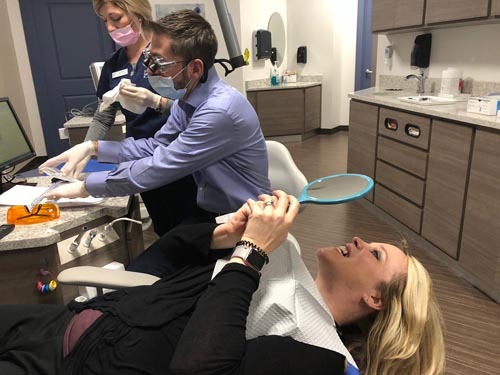 Making a patient’s dream a reality is something not many other professionals can claim, and there is nothing more fulfilling than removing the orthodontics at the last visit and seeing that brand new smile on the patient’s face. 1. Joffe L. Invisalign: early experiences. J Orthod. 2003;30(4):348-52. 2. Buttke TM, Proffit WR. Referring adult patients for orthodontic treatment. J Am Dent Assoc. 1999;130(1):73-9. 3. Krieger E, Seiferth J, Saric I, et al. Accuracy of Invisalign treatments in the anterior tooth region. First results. J Orofac Orthop. 2011;72(2):141-9. 4. Gomez JP, Peña FM, Martínez V, et al. Initial force systems during bodily tooth movement with plastic aligners and composite attachments: A three-dimensional finite element analysis. Angle Orthod. 2015;85(3):454-60. 5. Kim TW, Echarri P. Clear aligner: an efficient, esthetic, and comfortable option for an adult patient. World J Orthod. 2007;8(1):13-8. 6. Clements KM, Bollen AM, Huang G, et al. Activation time and material stiffness of sequential removable orthodontic appliances. Part 2: Dental improvements. Am J Orthod Dentofacial Orthop. 2003;124(5):502-8. 7. Miller KB, McGorray SP, Womack R, et al. A comparison of treatment impacts between Invisalign aligner and fixed appliance therapy during the first week of treatment. Am J Orthod Dentofacial Orthop. 2007;131(3):302.e1-9. 8. Krieger E, Seiferth J, Marinello I, et al. Invisalign treatment in the anterior region: were the predicated tooth movements achieved? J Orofac Orthop. 2012;73(5):365-76. 9. Kuo E, Miller RJ. Automated custom-manufacturing technology in orthodontics. Am J Orthod Dentofacial Orthop. 2003;123(5):578-81. 10. Nayar S, Bhuminathan S, Bhat WM. Rapid prototyping and stereolithography in dentistry. J Pharm Bioallied Sci. 2015;7(Suppl 1):S216-9. 11. Dasy H, Dasy A, Asatrian G, et al. Effects of variable attachment shapes and aligner material on aligner retention. Angle Orthod. 2015 Feb 26. [Epub ahead of print]. 12. Bouchez R. (2011). Clinical Success in Invisalign Orthodontic Treatment. Paris: Quintessence Pub Co.
13. Feinberg KB, Souccar NM, Kau CH, Oster RA, Lawson NC. Translucency, stain resistance, and hardness of composites used for Invisalign attachments. J Clin Orthod. 2016 Mar;50(3):170-6. 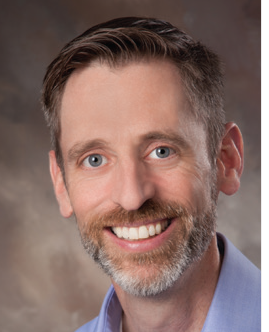 Darren Forcier, DDS, specializes in orthodontics and dentofacial orthopedics in Depew and Clarence, New?York. He maintains his private orthodontic practices after practicing in the U.S. Army for nine years as a general dentist and an orthodontist. As an Invisalign Elite Provider, Forcier treats at least 60 Invisalign cases every six months. He is a member of several professional dental associations, including the American Association of Orthodontists; the Northeast Society of Orthodontists; the Eighth District Orthodontic Academy (Western New York), for which he is a past president; and the Erie County Dental Society, for which he is a past president and current treasurer.